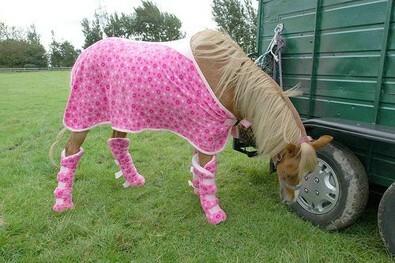 I’ll be the first to admit… I’m not much of a horse person. Not because I don’t like horses, but just because I wasn’t raised around horses and there’s so much I don’t understand about horses. Still, certain “horse things” are intriguing to me. Some of them, I share below. 1. Up until recently I didn’t know why they put masks (I call them “blinders”, but I think they’re called “blinkers”) over a horse’s eyes whenever the horse is just minding its own business in the field. I thought maybe it was to prevent nervous horses from getting distressed when they’d see people or cars pass by. 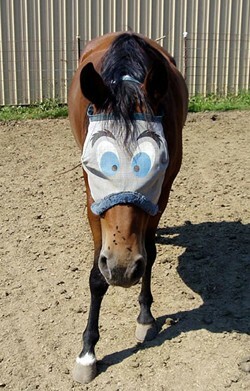 Hilarious photo: A New Eye Mask Helps Horses Sleep! 2. Along these lines… did you know that those little birdhouses and boxes that you see scattered intermittently along the fences of large farms are actually mosquito traps?! Yep, they’re used to help prevent the spread of disease and illness from insects to farm animals. …And I just thought farmers were bird lovers! 3. 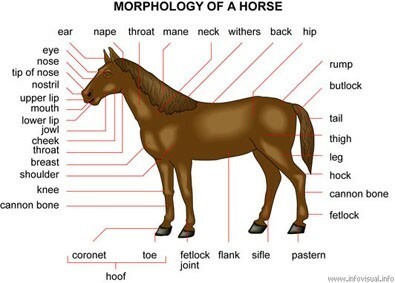 Can you name all of the main parts of a horse??? But thanks to this chart, I can now! The average lifespan of a horse is around 20-25 years. Horses at grass spend around 11-13 hours a day grazing. Yes, horses can swim. Many really enjoy the water! A horse’s hoof is always growing, just like your fingernails, so shoes need to be re-fitted regularly. Horses generally sleep standing up, but spend some time lying down if they feel safe enough. To this day, I can remember precisely what I was wearing, what car we drove to get there, and all the smells that were new to me on the one occasion I did try horseback riding — in 2nd grade. My friend (Courtney Causey) and her family had some horses, but that single ride was my first and last encounter with a horse. Everything You Could Possibly Want To Know About Horses… And More!